Social media and the ubiquity of data have fundamentally changed the way products and services are bought and sold. We are now in an era of social selling where the art of appealing to the savvy buyer takes place online long before the deal is closed. 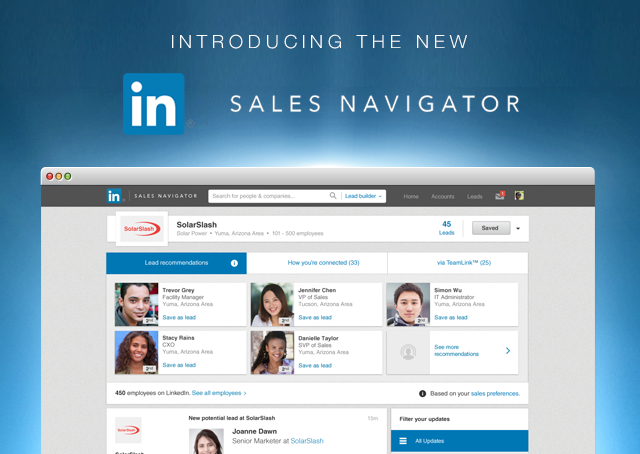 Today, I’m pleased to announce the launch of the new Sales Navigator. A significant refresh to our existing solution, it has evolved into a SaaS product that empowers sales professionals to establish and grow relationships with customers and prospects. Sales Navigator is a data-driven product that enhances the buyer-seller relationship and makes it more efficient. Tapping into the power of our network of 313 million members, and the data that underlies it, we make it easy for sales professionals to stay updated about key accounts, focus on the right people, and build trusted relationships along the way. We took a great deal of time to understand the sales professional’s daily experience and created Sales Navigator as a standalone product tailored specifically to their day-to-day needs. Sales professionals will be sent insights directly to them about the accounts and contacts they care about. ADP, Hootsuite, Juniper Networks, Hyland, creator of OnBase, Akamai, Birst, Lattice Engines, Chatham Financial and Swiss Re, are a few of our pilot customers who are already leveraging social selling through the new Sales Navigator with positive results. 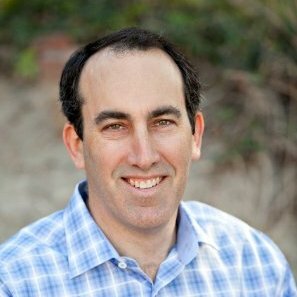 Notifications: job changes, common connections, etc. Here’s what’s different. Users of the original Sales Navigator conducted their social selling efforts through their LinkedIn member experience. The updated version of Sales Navigator is a completely standalone experience -- with a separate login -- that brings comprehensive information directly to the salesperson. Many features like lead recommendation by account, news mentions, and account recommendation are being made available for the first time. Additionally, finding other important insights in the original Sales Navigator required complex manual searches, which is hard to scale if a salesperson is managing more than a few accounts. Now all of this information is presented to the sales professional through the new Sales Navigator. We’re launching on desktop and mobile Web today, and will be available in English-only at first, but we plan to later launch mobile apps and make it available in multiple languages. The pricing is on a per-seat basis, and we’re selling this through both our self-serve online and field channels. Our goal is to make the right matches between buyers and sellers, but we know that not everyone on LinkedIn fits into these two roles. If a member currently has limited contact with sales professionals on LinkedIn, this doesn’t suddenly change. Members can decline connection requests and block members if they aren’t interested in being contacted. As we do with all of our products, we’re approaching this with a member-first perspective. The launch of the new Sales Navigator underscores our opportunity to continue building scalable, diverse businesses that add value for both our members and customers. I am delighted to see Sales Navigator evolve as it has, and look forward to seeing all the possibilities it brings. If you want to learn more, please visit our Sales Navigator page.